It is time to start thinking about holiday baking. I have been pulling new recipes to try and experimenting a little bit. Last week I recreated a favorite using Pillsbury refrigerated cookie dough. 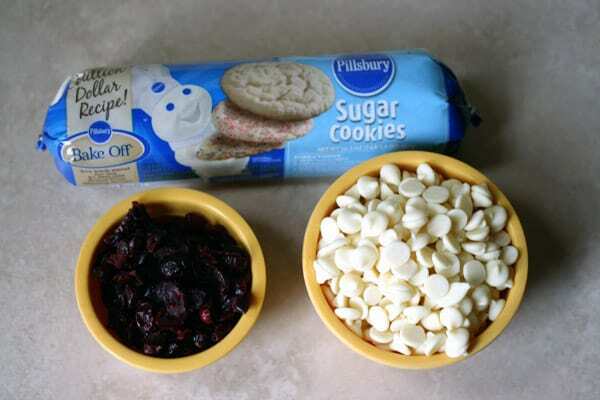 The Pillsbury® Refrigerate cookie dough made baking these White Chocolate Cranberry Cookies so easy. A group of bloggers were invited by General Mills to share recipes using their Pillsbury refrigerated cookie dough. We were paid for our recipes but my opinion is completely mine! 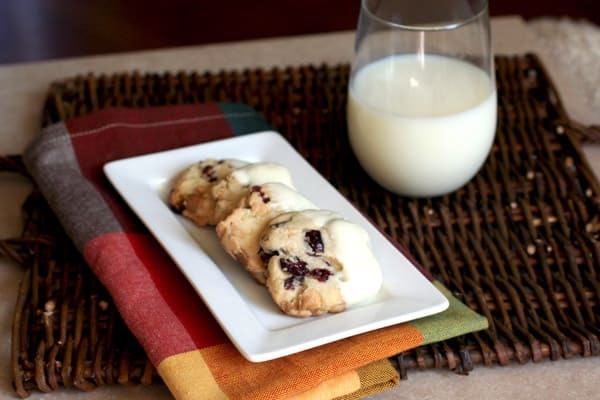 A few years ago I added White Chocolate Cranberry Cookies to my yearly favorites. I love the sweetness of the cranberries and the flecks of red peeking out of the sugar dough looks so pretty. Working with General Mills I have started discovering how many other ways you can use their cookie dough. For most of my life, I just cut and sliced like the directions said but I have discovered a whole other world of baking with their dough. When I have a few rolls of their dough in the refrigerator it’s easy to make cookies with my niece and nephews when they are over. Another time saver I use for the holidays is to make a batch of these cookies and form the dough into a log. I wrap them and refrigerate. The dough will keep in the refrigerator for several days, after that I throw it in the freezer. When I am going to a party I can slice and cook while I am getting ready. I box them in a cute box, wrap with a ribbon and I have a homemade gift to bring to the party. This is a recipe that the children can easily help out with. Let them crumble up the dough in the mixing bowl. They can help roll it into a log. 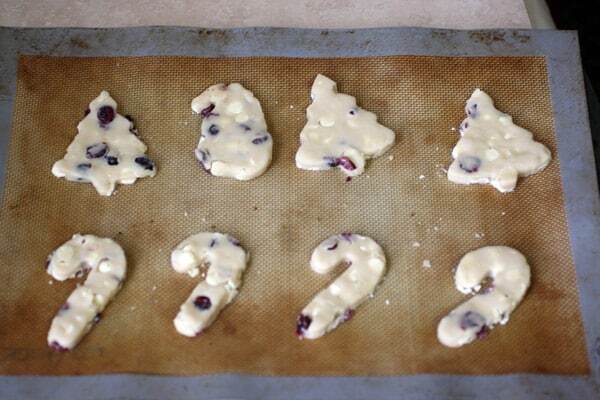 Cut out your slices and place a baking sheet. I like to line mine with a silpat but you could spray or line with parchment paper too. If you want to be fancy roll out the dough and cut out shapes. This is where the kids love to jump in and help. Bake them until they are just starting to turn brown and then remove from the oven. Once they are cooled melt white chocolate in the microwave in 30 second intervals until the chocolate is smooth. Be careful – it is better to under cook. If you over cook the chocolate will brown and granulated. Let the kids dip the cookies in the white chocolate and then place on wax paper or parchment paper to dry. For more tips and to see what my fellow bloggers have baked for you go over to Pillsbury.com. What have you made with Pillsbury dough? Please share in the comments below. 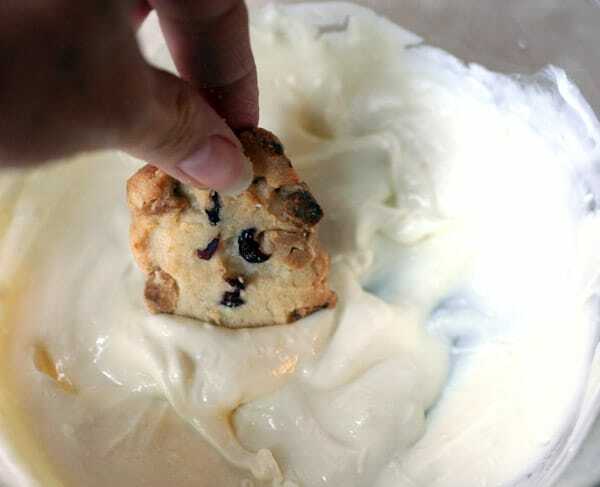 Break up the cookie dough in a mixing bowl fitted with a paddle. 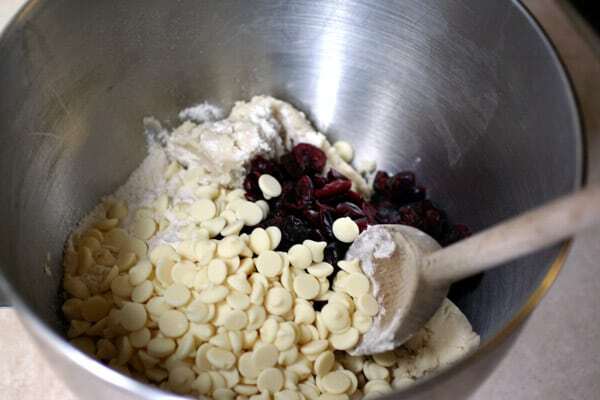 Add cranberries and white chocolate to the dough and mix. Form into a roll and slice into 1/4 “ rounds. Place the rounds on a lined baking sheet and place in oven. Bake for 15 minutes or until edges are turning just slightly brown. Remove from the oven and cool. 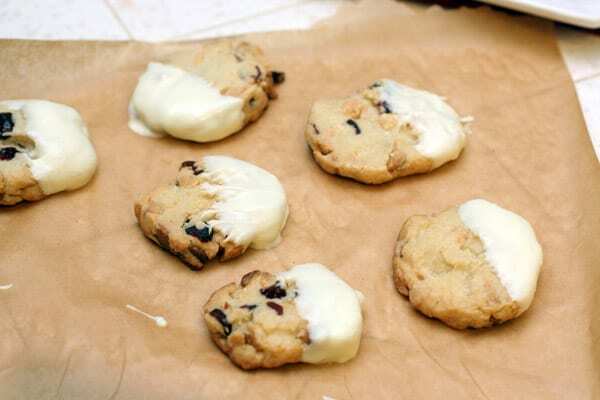 Melt the remaining white chocolate chips in the microwave or in a bowl over simmering water. Dip the cookies half way into the white chocolate and place on parchment paper to harden.